My pancake conundrum: My husband doesn’t like them. I do. So when it comes to a batch of pancakes it’s either – make a couple of pancakes and let the rest dissipate into inedibility in the fridge, or eat the whole batch. Both options leave much to be desired. I am trying to avoid food waste and I already know that I can’t eat a whole batch of pancakes (without rendering myself totally useless for the rest of the day). The third, absolutely intolerable and unacceptable, option is not to make pancakes at all. Which is just not going to happen. The best I can do for now is reduce the pancake or crepe recipes I try by as much as I confidently can and then plan to breakfast on pancakes, or anything similar using the same batter, 2 days in a row (leaving the leftover batter to sit in the fridge overnight, which I think is ok because crepe batter is supposed to benefit from an overnight rest). Hopefully, aside from the breakfast pancakes or crepes, I can work it out so I have friends over to whom I can serve a dessert or appetizer made with the excess batter (maybe Nutella crepes or smoked salmon rolls). Or I can wait until a brilliant blogger like Suzana of Home Gourmets declares Pancakes to be the theme of the next round of Hay Hay it’s Donna Day! – Place the sugar and cinnamon on a plate and mix. – Place the flour and the extra sugar in a bowl and mix to combine. – Place the eggs, cream, and milk in a separate bowl and whisk to combine. – Gradually add the egg mixture to the flour mixture, whisking until smooth. Allow to stand for 20 minutes. – Heat a lightly greased non-stick skillet over medium heat. Add 1/3 cup of the batter and swirl to cover the base of the pan. – Cook crepes for 1-2 minutes in each side until golden. Place on non-stick baking paper and repeat with the rest of the batter (or just make the amount you need and place the rest of the batter in the fridge like I did). 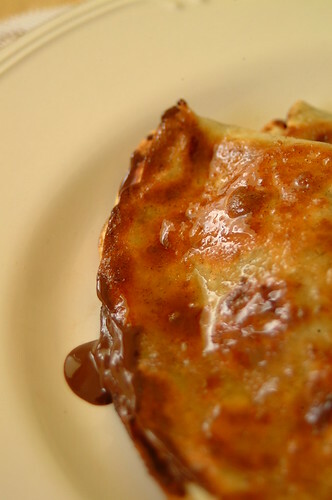 – Sprinkle 1 tablespoon of chocolate over each crepe, fold in half, and then fold in half again. 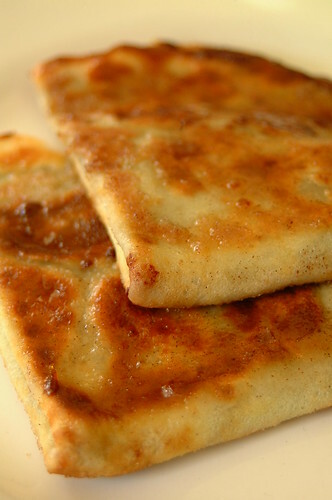 Brush both sides with melted butter and press into the cinnamon sugar mixture. – Cooked the sugared crepes in a lightly greased non-stick pan (high heat) for about a minute on each side, or until the sugar is caramelized. The combination of the dark chocolate and the subtle cinnamon flavour was perfect! But what really takes this over the edge into goodness oblivion is the caramel-ly exterior, all sweet stickiness and crunchy edges. I can see this being a fantastic dessert but, being a creature of breakfast, I had it in the morning with my coffee…bliss! I’m sure it’ll be great with a bit of vanilla ice cream too! 1) How long can you keep pancake/crepe batter safely in the fridge? 2) Any other variations you like? Savory and sweet suggestions are welcome!